Arsenal face rivals Tottenham at Wembley on Saturday in what is a potential crunch clash between the two sides in the battle for a top four finish this season. A win for the Gunners would move them to within just a point of their bitter rivals in third place, and so coupled with Mauricio Pochettino’s men stumbling in recent weeks, it will be a big test for them to overcome. However, Unai Emery hasn’t received the greatest of reactions to his starting line-up for the encounter, as seen in the tweets below. Many Arsenal fans have been left stunned by the decisions to leave Lucas Torreira, Pierre-Emerick Aubameyang and Mesut Ozil on the bench, and have shared their frustration below. Meanwhile, Alexandre Lacazette returns to the starting line-up along with Granit Xhaka, while the other big call from Emery sees Henrikh Mkhitaryan keep his place in the XI from the side which secured a 5-1 win over Bournemouth in midweek. It’s a big call to leave such quality players on the bench, and perhaps the biggest shock is Torreira in many ways given the tenacity, energy and work-rate that he could have provided in the heart of the midfield to give Arsenal a foothold in the showdown. 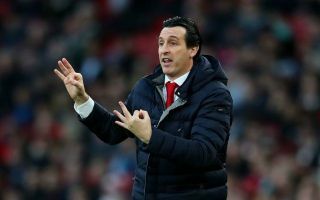 However, he’ll have to be content with a place on the bench, with Emery undoubtedly at risk of facing a backlash if the result doesn’t go Arsenal’s way this weekend.
? NORTH LONDON DERBY TEAM NEWS ? No torriera. No Ozil. No Auba. No chance. Torreira, aubameyang and ozil on the bench ? HOW DO YOU NOT PLAY TORREIRA FFS??? ?